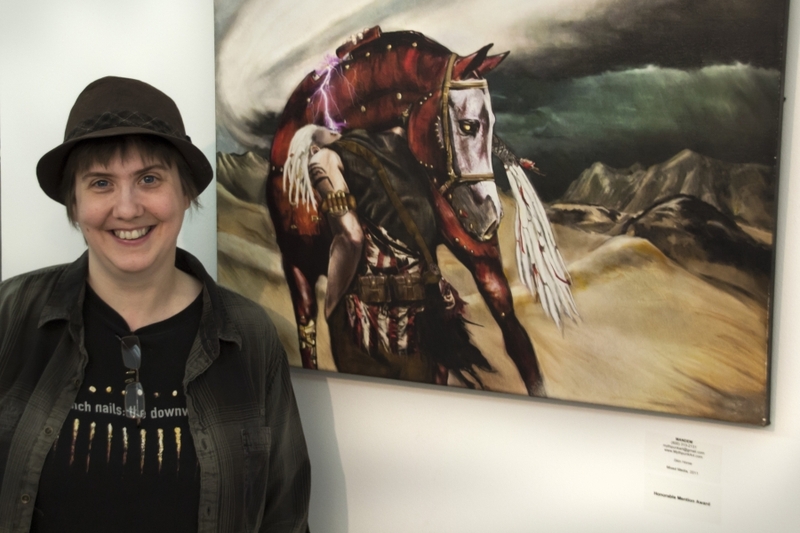 On April 5th, Florida State University art student M. Arendsee (known by the art name MANDEM) was awarded an Honorable Mention for the painting ”Skin Horse” in the 2013 Creative Tallahassee juried exhibition held at Tallahassee City Hall Art Gallery. ”Skin Horse” is one of two pieces of artwork by MANDEM that was selected for this year’s exhibit. Creative Tallahassee is a highly-anticipated annual juried exhibition featuring the work of many well-known and emerging regional artists. This award comes just one week after MANDEM’s transdigital artwork appeared at the 2013 DigiTech showcase at FSU. As the 2012 winner of the Best in Show award (for the creative categories), this year MANDEM was displayed alongside other past recipients of this honor. Creative Tallahassee will be on display until April 29th, 2013. The City Hall Art Gallery is located on the second floor of City Hall at 300 South Adams Street and is open Monday through Friday, 8:00am–5:30pm. Learn more about Creative Tallahassee from COCA’s website: http://www.cocanet.org/news/2013/3/1/creative-tallahassee-2013.html.